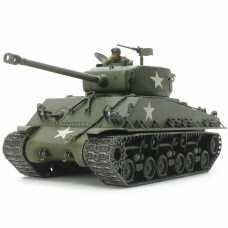 The â€œEasy Eightâ€ rolls into accessible 1/48 scale! This subject, which has proven popular in 1/35, is a welcome addition to the 1/48 Military Miniature Series, and is depicted as it appeared in the European Theater of WWII. This is a 1/48 scale plastic model assembly kit. Length: 156mm. width: 62mm. In-depth surveys of actual vehicles provided the inspiration for this highly accurate kit in compact scale. Slide molded parts artfully capture different surface textures of cast turret and welded upper hull panels. Four hull weights give the model an authentically weighty feel. Comes with a commander torso figure and 2 marking options (given below).